We create the perfect gifts for the small people in your lives. We have a great collection of adorable doll quilts for American Girl and other dolls. Each quilt is home made and one of a kind. We even have sets for little girls and their dolls to match. 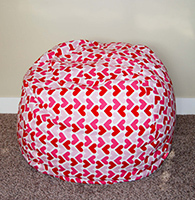 We also create amazing bean bags, to be filled at home, either with bean bag filler or with a child's stuffed animal collection. They are the perfect stylish addition to any bedroom or play room. Check us out on Etsy or on instagram @thoroughlymodernminis. We will be joining the Beehive Bazaar- December 5-7.